The Great Lakes Missionary Baptist Association women’s department will be holding its Annual World Day of Prayer at the Mount Olive Baptist Church, 701 East Delavan Avenue on Monday, November 5, 2018 at 7 pm. To donate five dollars, see Sister Conrad or Sister Bates. Please support. 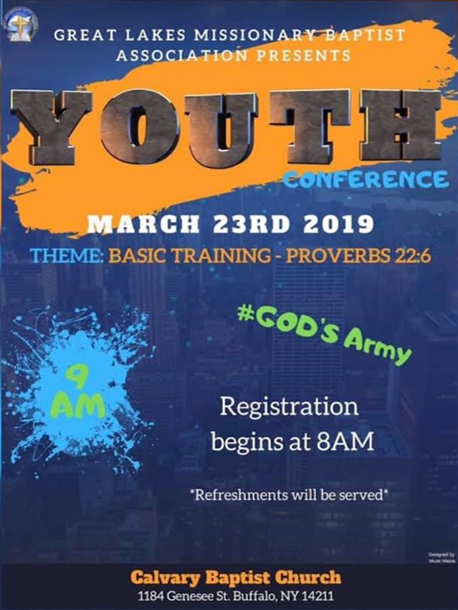 The Youth Ministry will be hosting the Great Lakes Young People Ministry Youth Conference here at Calvary on Saturday, March 23rd. Theme: “Basic Training – God’s Army” Proverbs 22:6. Registration begins at 8:00 am. All youth are encouraged to attend and bring a friend. Emmanuel Baptist Church 1782 Clifford Ave Rochester, NY 14609 will be holding a musical as a tribute to Sister Stribling and commemorating the 20th anniversary of the conference. Calvary Baptist Church members are welcome to attend. Please contact Mabel Andrews for travel details. The Great Lakes Missionary Baptist Association Women's Department will be holding 20th Annual Walterine Stribling Women's Conference at Emmanuel Baptist Church 1782 Clifford Ave Rochester, NY 14609. Pre-Registration fee is $35.00. Onsite registration begins at 8:00am day of the event at a cost of $40.00. Calvary Baptist Church members are welcome to attend. Please contact Mabel Andrews for registration details.